"I am very grateful for the confidence in me shown by the club, choosing me to be the Managing Director of the New York office. It is a great professional challenge that I am looking forward to with great enthusiasm, and I have a great desire to use my knowledge of the Club, the Sports Department and the Business Department, and my experience as Professional Sports Manager to expand the Barça brand in a market as strategic as the American continent," says O'Callaghan. O'Callaghan highlights the importance of tours and direct contact with fans. "One of the keys to strengthening the brand is making sure that they know more about us and know us more closely, so the tours are very important. We are returning to the United States for the second consecutive year and we can see that people are very interested in Barça. We have to be able to transmit that we are a different club, that we are more than just a club for many reasons. We have to make sure that they don’t just know stars such as Messi, Suárez, Coutinho and Piqué. We need them to know that we have an academy that is a reference in athlete training, a Foundation that helps more than one and a half million children around the world, and we want to lead research and innovation in the sports industry with the Barça Innovation Hub." Finally, the director of the NY office added that the club's commitment to a mixed tour, incorporating the presence of Barça Women, will be a boost in the development of the Barça brand in that country. "The commitment to women and women's sport is strategic, and in the United States the importance that women have in the world of football is very large. That's why we have a great opportunity to expand our brand in this market thanks to Barça Women and the team we want to have in the future in the National Women Soccer League (NWSL) league. We have been pioneers in organising a mixed tour and we have the chance to be the first European club to have a professional team in this league." 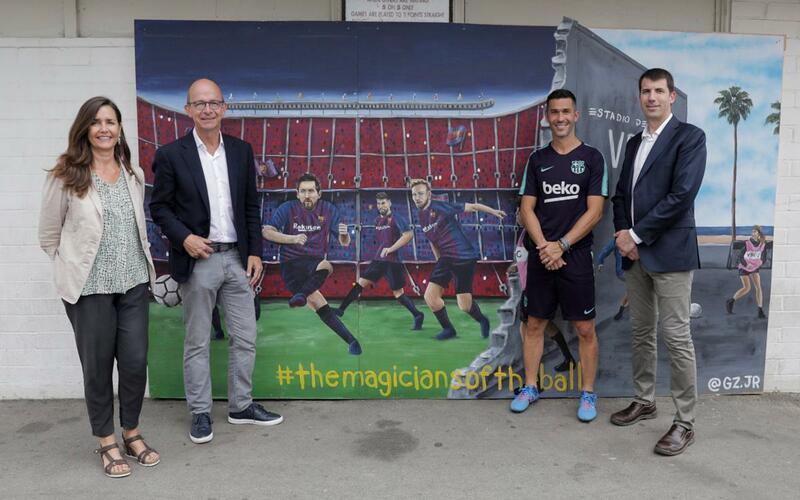 Cardoner: "We want to make an impact in Los Angeles"
FC Barcelona’s first vice president, Jordi Cardoner, said FC Barcelona is having a very positive impact in the United States. "Today, we are no longer new to the United States. We have experience there. Over the last academic year, we reached, with the support of the New York Department of Education, 300 students from three schools in Queens, with Goya Foods as the sponsor." "Los Angeles is a priority and we want to make an impact there. FC Barcelona plans to make the 'More than a Club' slogan a reality. We are not just talking about sports excellence and we are not referring only to players, who obviously are part of our environment, but rather FutbolNet, the tool that represents our methodology, in order to integrate boys and girls and work to reduce with violence. In many of these neighborhoods and communities, there are conflicts that we want to resolve through the values inherent in sports," said Cardoner. "In Los Angeles, we have been able to work with 60 boys and girls from a conflictive zone — district 9 — which has important social challenges to deal with. We are convinced that we are in a battler to improve social welfare, and where once more sports can serve as the catalyst to help resolve these conflicts.“ he said.